It's been a busy week of doctor appointments and family commitments and I feel like I've been in a whirlwind of activity with not a lot to show for it! Do you have weeks like that, too? My first blessing is that I had a knee shot this week after over a year of not getting one. The shots I get are called Supartz and they help your knee to re-grow the cartridge in my joint for pain relief. They do help me so much and I'm so thankful to be able to get them again. I also had a different doctor do the shots and it was even less painful than usual. Double blessing! Yay! I've been working on my house and getting things organized but I don't have a picture to show you. I'm going to put an edging on it but haven't decided what yet. I still need to add some squares so the edge is down the road but I've been looking at different types. I haven't had any new clothes for quite some time and, by this, I mean years. I think I've bought one new shirt in the past 5 years so I was over-due! I found this adorable shirt at WalMart and am pleased with it. I like flowery shirts that are different. How was your week? Please share on the linky below! So glad to be back in your link up, Julie. Sharing my travel blessing escapade last year. Thank you! Julie, I pray for total healing for your knee in Jesus' might name! 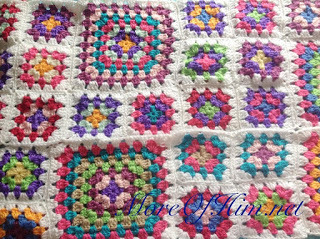 The afghan that you're making is so lovely and seeing it brings back such sweet memories for me. My Grandmother always made these beautiful afghans when I was growing up and I can remember that even back then, people would come from all over to buy them from her for hundreds of dollars. Also, when you said that you're only five foot one so your shirt is quite long on you, I had to laugh a little because that is the story of my life. LOL! I'm five even on a good day. Although, some might argue that I'm shorter. Haha!